Melanie is busy making another sale as Matt and Gemma arrive. She hangs up the phone and tells them how exciting her job is, she has great admiration for some of her clients. While Melanie goes off to sort the dinner, Matt notices that she has been making quite a large profit with her sales. Gemma jokes that he'll be able to take her to Paris soon, but Matt admits his technique is not quite as good as Melanie's. Gemma suggests that he uses Melanie's technique, but Matt doesn't think it'll work for him. Gemma points out that he's got charm, he just needs to use it. Having finished feeing Sky, a very distinct call comes from the front door. Recognising it immediately, Madge rushes to the door, hugging Joe and Toby as they arrive. Taking Sky off Harold for a hug, Joe enquires how she's been. Harold admits that she's been missing Kerry, but they have been coping. 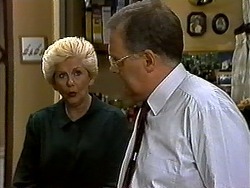 Madge informs Joe they have some news, and encourages Toby to take Sky to the other room. Joe realises that the news can't be good. Josh is keen to find out about the dance class from Melissa; did she dance with Justin? How much did he pester her? etc etc. Cody reminds him that they're supposed to be studying, but it seems Josh can't concentrate on his work. Asking to borrow her biology notes, Josh offers to get them from her bag. Watching on Cody notices him removing the microphone from Melissa's bag, un-noticed by Melissa herself. Melanie is thrilled to calculate that if she takes on the sales full time and continues a 1 in 3 success rate with her clients, then she may be able to consider it her full time job. Unsure, Matt doesn't agree, but a call from one of Mel's clients would suggest otherwise as she thanks Melanie for her advice, reporting on a success. 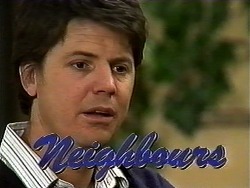 Paul pops over to enquire if Melanie wishes to return to work, giving her a final chance. Melanie confirms that she is happy in her new job and has no intention of returning to work for him, showing him to the front door. Harold tells Joe of how they searched caravan parks to try and find him. Joe worries that Eric might take Sky away from him, but didn't think he was the kind of bloke to do that when he met him last. Harold recons that they should keep the appointment with the solicitor before the court case. Joe agrees; Kerry would forgive him if he lost Sky. Seeing Melissa out the door, Cody lays into Josh about what he's up to, regarding the item he removed from Melissa's bag. Josh claims nothing is going on. Not believing him Cody warns him that he could soon be using his crutches permanently. Todd warns his friend that he should probably spill, so Josh eventually owns up. Cody is shocked to hear about his behaviour, but admits that she hasn't heard anything from Melissa about Justin asking her out. Josh interprets it to mean that she must've said yes. Melanie is shocked to hear about the court case, but Matt suggests they don't make a big deal out of it. Coming through to the lounge, Melanie apologises to Joe about all the boxes, and says she'll start looking for a new place in the morning. 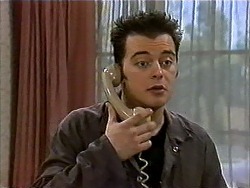 Joe tells her not to worry about moving out; he could do with the extra rent to help him through the court case. Paul pops in to deliver a cheque to Madge. Returning from the solicitor's meeting Harold and Joe admit they are both confused. Joe has a good chance of maintaining custody of Sky, given all the love and care he's provided for her so far, and the added bonus of grandparents across the road, though admittedly as her biological father, Eric also stands a chance. Joe decides to go and collect Sky from her babysitter, to spend time with her, whilst he still has the chance. Josh tries to invite Melissa to a gig on Saturday night, but she has a party for her grandmother. Josh questions the party, but Melissa ensures that her gran is very old, so it'll be just immediate family over. Making another sale, Melissa is pleased with her day's work and heads of to make dinner, leaving Matt to have a go. It seems his client is more interested in his physique than the beauty products he has to offer. Having invited Melissa round, Cody tries to spill the beans about Josh's scheme, though is interrupted by Todd. Eventually telling Melissa, she asks what her verdict was on Justin asking her out. However Josh arrives; admitting that what he did was wrong, Melissa informs him that she said no, but would rather he asked her in person. Realising they have some making up time needed, Cody grabs Todd and they head out. Josh takes the opportunity to ask Melissa who the better kisser is out of him and Todd. Unsure, she asks to kiss him again, though this time, long and slow! Going over the solicitors paper once more, Joe tries to figure out the best way to win the case. He decides that to win, he's going to become Australia's 'father of the year', and give Sky more stability in her life. Toby wanders in from the garden, but admits Sky wasn't outside with him. Not in the house either, Harold and Madge realise she that none of them know where she is, but this doesn't seem to bother Joe who comments that she'll reappear when she wants to. Having spoken to the same guy for the third time that day, and agreeing to meet him, Matt warns Melissa to be wary of her clients as she has no idea what they are really like. Paul reappears asking Melissa a question on the filing at the office. Having explained the system to him, he asks if she'd return with increased responsibility and salary. She shows him her calculations for the beauty company profits and he admits he won't be able to match it, wishing her luck with her new job. Having searched the backyard, Gemma reports no sign of Sky. Beginning to get worried, Madge gets everyone onto searching the rest of the house, but Joe can't see what the big deal is, she's only been gone a few minutes. About to call the police, Madge reveals that Eric has been keen to see Sky, and Madge didn't let him, but he continued to hover around the house. It dawns on Joe just what he might be up against in the custody battle for Sky.